They’re fast, they’re creepy and they’re probably in your house! Centipedes are definitely some of the creepiest creepy crawlies, and are even scarier to find in your home! Here’s how to get centipedes out and keep them out! The house centipede definitely doesn’t look like anything from this planet and with thirty long legs it appears to slither rather than walk. Growing to almost four inches in length these guys can be pretty scary. Centipedes like to live in cool damp places, under rocks in nature or moist places in your home. When in your home you can find them in bathrooms, basements and anywhere else with high moisture. Decrease Moisture- centipedes need a moist environment to survive. By using a dehumidifier you can take away the humidity forcing the centipedes to find a new, wetter place to live. Get All Other Insects Out- centipedes are insectivores meaning, they only eat other insects. If you can get all other insects out, centipedes will have nothing to eat and will get out of your home fast! Seal Cracks in Your Foundation- most centipedes find their way in through cracks in your foundation. These cracks don’t just let moisture in centipedes are quick to follow. Go to your local home improvement store and pick up some insulated foam to fill those cracks! 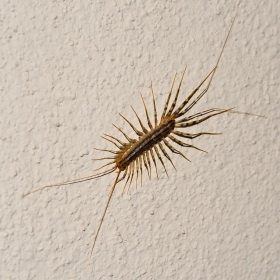 Keep Natural Homes for Centipedes Away from the House- centipedes like most insects don’t travel far. But if your home is just a short walk away, centipedes will definitely stop by. Keep mulch and other natural homes such as woodpiles away from your house to keep them out. Spray a Barrier Around Your Home- products such as Weed Pro’s Home Perimeter Pest Spray creates an invisible barrier around your home. These barriers prevent centipedes and other pests from entering your home. Weed Pro sprays this barrier four feet away from the house and four feet up your home’s foundation providing ultimate protection from these unwanted guests. Want More Tips on Keeping Insects Out of Your Home?